We identified the areas where legal teams pose the most questions and provided the answers to help fill the knowledge void that exists in the marketplace. 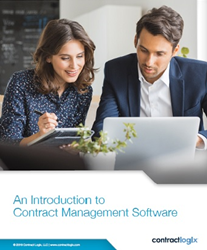 Contract Logix – a long-time developer of contract management software – has published a new whitepaper titled An Introduction to Contract Management Software. The whitepaper is an educational primer on contract management digitization and is essential reading for anyone who has a role in drafting, reviewing, approving, or managing contracts. It leverages knowledge and expertise gained during the company’s 12+ years delivering technology solutions to legal and other contract-focused professionals. In-house legal teams are experts at managing corporate risk. Yet, many actually create greater risk with their contract management processes. Many still manage their organization’s contracts manually, or via a variety of make-shift tools not specifically designed for contract management. These practices not only expose organizations to the legal and financial risk that’s inherent in their contracts, but also to the security risk associated with storing contracts in insecure filing cabinets, hard drives, or shared folders. An Introduction to Contract Management Software is designed to help in-house legal teams combat this issue. A must-read guide on contract lifecycle management technology, this educational report will provide contract professionals with a baseline of knowledge so they can take action. “Every day we speak with organizations that want to get started in automating the management of their contract lifecycle,” said Rick Ralston, CEO of Contract Logix. “A high percentage of them don’t know where to start, what questions to ask, or how contract management technology functions. So, we identified the areas where legal teams pose the most questions and provided the answers to help fill the knowledge void that exists in the marketplace,” Ralston added. The whitepaper addresses contract management software’s most important value proposition for legal teams -- its ability to identify and help mitigate areas of risk that exist in all contracts. This risk can take many forms, including: missed deadlines or milestones, failure to meet contractual obligations, version-control problems, or using non-compliant contract language. “Over the last decade, we’ve empowered many different organizations to digitally transform their contract management processes. For legal departments still struggling with their own digital-readiness, we hope this whitepaper will help educate them on the steps involved in that process and accelerate the digitization of their functions as well,” Ralston concluded. Read the whitepaper without requiring your contact info, or download it as a PDF here. Contract Logix is a long-time innovator and provider of contract lifecycle management software. The company delivers products that leverage the knowledge gained over its many years in the industry. They are easy for everyday business users to adopt, yet powerful and secure enough to help them minimize the legal, financial, and brand risk inherent in their contracts. These products enable professionals in legal, administration, procurement, finance, and sales to electronically draft, negotiate, approve, execute, and manage their contracts. With Contract Logix, your risk stops here!